Successfully Added Laser Sighted Ultrasonic Range Finder to your Shopping Cart. Accurate distance measurement device makes a powerful upgrade to any toolbox! 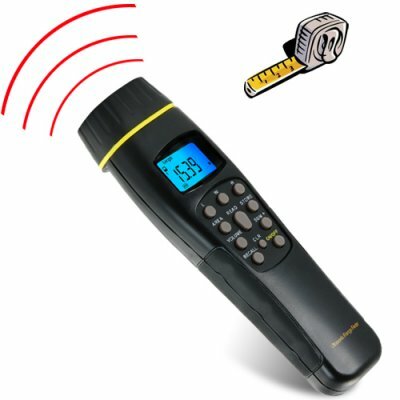 Simply, fix the laser on a distant spot and get an instant readout in meters or feet! How does it work? Ultrasonic range finders bounce sound waves off distant objects and record the time it takes for the wave to return in order to measure the distance. It's the same technology, SONAR, that bats use to navigate in the dark. Add to that laser sighting for better aiming, and the Laser Sighted Ultrasonic Range Finder is your new best friend for indoor or outdoor projects! Ruggedly constructed and easy to use, the CVHM-G92 comes fully featured with the ability to store your readings to find the sum of multiple length measurements, as well as the calculation of area and volume. It's been designed with a bright LCD display for readings in low lit environments as well as an auto shut off timer for battery conservation. What's more, this measuring device can be used anywhere in the world - simply click on the "unit" button to toggle between metric and imperial measurements! How's that for measurable convenience? The CVHM-G92 is a handy tool for home, work, or industrial use. Absolutely essential if you do any type of surveying work, it's the gauging tool of choice for planners, engineers, architects, and designers. Need to know the drop from the ducts to the floor? Aim and press the range finder to find out! Need to know the sectional volume of the basement for custom tub installation? Aim and press this amazing ultrasonic area and volume finder to know for sure! Click "Add to Cart" right now to purchase one for your own toolbox and then after you find out how great they work, order another dozen to resell on online. Brought to you by the leader in online direct from China wholesale electronics - Chinavasion. Calculates area and volume too! Get instant AREA and VOLUME calculations. For example, when calculating AREA, take a length reading, press the AREA button, take a width reading, press the AREA button again and the length and width will be automatically multiplied and the answer displayed as the AREA for you. SET button feature which allows you to toggle between measuring distances from the front or the rear of the ultrasonic range finding device. In what way is this device ultrasonic? Sonic refers to audible sound, while ultrasonic refers to sound that our ears can't hear. This device uses inaudible sound waves to measure distances. In definately is more handy than a classic measuring tape, however some situations require little modifications (place a barrier at the end of point you wish to measure to) and the it still works perfect and much faster than the classic measuring tape. At first, you don't quite believe given reading, but you will get used to it and start to trust measurements later. Thank you chinavasion, the service was fantastic, so quick to New Zealand. The product is fantastic and it even came with a battery. Will certainly do business again.